Traffic on the N3 Toll Route between Gauteng and KwaZulu-Natal is expected to increase sharply from Thursday, 18 April and high traffic volumes are expected to continue through Friday, 19 April. 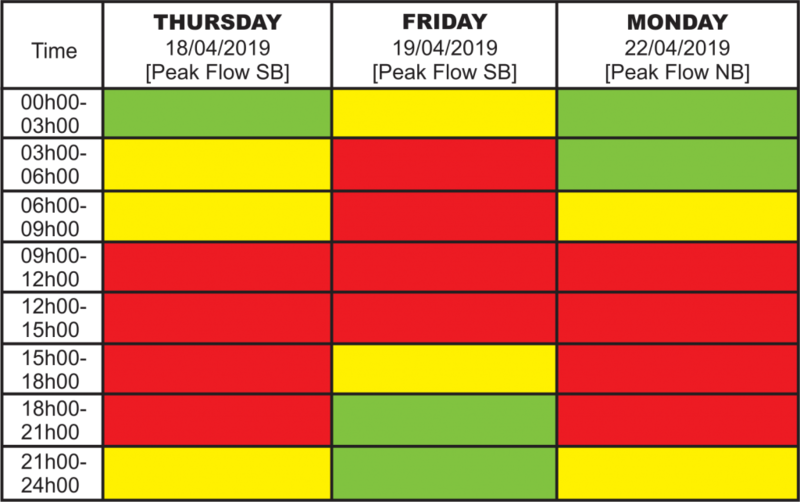 Thereafter, the busy conditions will taper down until Easter Monday, 22 April when peak traffic conditions are expected throughout the day as holidaymakers return from their long weekend breaks. Easter Monday is always one of the busiest traffic days on the N3 Toll Route. Road users are encouraged to carefully plan their trips and to be prepared for possible congestion and delays. “N3 Toll Concession (N3TC) highly recommends road users plan their trips in order to travel outside of peak times. Do not leave your departure for your destination until too late in the day. With between 2500 and 3500 vehicles per hour expected to be on the N3 Toll Route at peak times the risks and demands on drivers increase exponentially,” says N3TC’s commercial manager, Con Roux. The grid below provides an overview of expected traffic volumes and peak conditions on the N3 Toll Route in a southbound (SB) direction (towards KwaZulu-Natal); and a northbound (NB) direction (towards Gauteng). GREEN: Light to slight increase in volumes < 800 vehicles per hour (vph) in a particular peak direction. YELLOW: Busy traffic conditions with 800 – 1500 vehicles per hour (vph) in a particular peak direction. RED: Heavy (high) traffic volumes (with slow-moving conditions) > 1500 vehicles per hour (vph) in a particular direction. ALERT: High peak flows of 2500 vph on Thursday, 18 April March and Friday, 19 April (in a southbound direction towards KwaZulu-Natal); and 3500 vph on Monday, 22 April (in a northbound direction towards Gauteng) can be expected. All N3TC toll plazas will be operating at maximum capacity. If congestion occurs, the Roads Traffic Inspectorate may have to manage traffic flow at toll plazas to ensure road users’ safety. The majority of fatalities on the N3 Toll Route are caused by human error, including reckless and negligent driving, speeding and drunk driving. N3TC’s crash data for 2018 lists a total of 1232 crashes; a 9,7% increase from the previous year. Of the total number of crashes in 2018, 86 were fatal and 73 were serious. Although the number of fatal crashes decreased in 2018 (from 119 in 2017 to 86) a 40.3% increase was noted in serious crashes from 52 in 2017 to 73 at the end of 2018. In both heavy- and light motor vehicle crashes, human error was listed as the main cause of these crashes. Of the 415 heavy vehicle crashes, 360 were directly linked to human error; and the data is very similar for light vehicles (519 crashes of which 374 were caused by human error). Vehicle failure, including tyre bursts and brake failure, is another major cause of crashes. 23 pedestrian fatalities were reported on the N3 Toll Route during 2018. Very often, these fatalities can also be linked to intoxication. Worldwide it is estimated that over a third of all pedestrians involved in fatal crashes were over the legal alcohol limit for drivers. “The simplest ways of ensuring your safety on the road is to always drive defensively, to be alert and to avoid distractions; and never get behind the wheel (or walk on or near roads) when you are not completely sober,” advises Roux. All emergency services and law enforcement authorities have been placed on high alert for the duration of the Easter weekend. N3TC is combining its road incident management efforts with various partners to enhance emergency capacity and safety along the entire route. Provincial and private medical services with intermediate and/or advanced life support units will be stationed at strategic points along the route. Volunteers from various medical rescue and humanitarian groups will be available to assist at major crash scenes and provide post-crash care support to victims. Stay up-to-date with the latest news updates from N3 Toll Route and get verified traffic information by contacting the 24-hour N3TC Helpline on 0800 63 4357. Essential information is also shared on an on-going basis from N3TC’s Twitter platform: @N3Route. Report any problems or obtain emergency assistance by contacting the N3TC Helpline. The nearest N3TC Route Patrol team will be dispatched to help ensure your safety. These highly trained teams are geared to provide help at crash scenes and with vehicle breakdowns. They also provide basic emergency medical care, assist with fire-fighting, remove hazardous objects from the road and provide regular route patrols to ensure conditions along the N3 Toll Route remain as safe as possible.